When you want to record a high magnification image of a planet or the Moon using a DSLR type or a CCD camera, one of the most used techniques is the one of eyepiece projection. 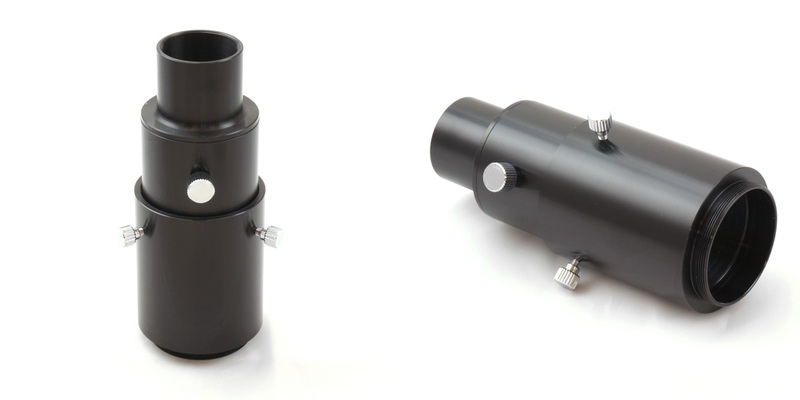 This 31.8mm eyepiece projection adapter fits in the 31.8mm focusers connection and allows you to put in a 31.8mm diameter eyepiece to increase the magnification and then use DSLR (with optional T2 ring) or CCD cameras with T2 thread for lunar and planetary photography. Compared to the non-variable version, this adapter has a mechanism to vary its length then, keeping fixed the eyepiece inserted inside, you can change the magnification in a progressive way. For eyepiece projection photography, a 31.8mm eyepiece is inserted into the adapter and locked with a screw. Then you connect the DSLR camera with the T2 ring (or the CCD camera with T2 female front thread) on one sinde and insert all in the telescope focuser. Attention: this adapter does not accept some 31.8mm wide-field eyepieces if the eyepiece barrel is too wide.